The Second Vatican Council rightly proclaimed that the Eucharistic sacrifice is “the source and summit of the Christian life”. “For the most holy Eucharist contains the Church’s entire spiritual wealth: Christ himself, our passover and living bread. Through his own flesh, now made living and life-giving by the Holy Spirit, he offers life to men”. Consequently the gaze of the Church is constantly turned to her Lord, present in the Sacrament of the Altar, in which she discovers the full manifestation of his boundless love (Section 1). “The Sunday Eucharist is the foundation and confirmation of all Christian practice. For this reason the faithful are obliged to participate in the Eucharist on days of obligation, unless excused for a serious reason (for example, illness, the care of infants) or dispensed by their own pastor. Those who deliberately fail in this obligation commit a grave sin” (emphasis added). We simply cannot be lukewarm about the Eucharist because the Eucharist is the great sacramental sign of our covenantal relationship with Jesus. The phrase “new covenant” is mentioned by Jesus only in the context of the institution of the Eucharist on Holy Thursday, where Jesus said: “This chalice which is poured out for you is the new covenant in my blood” (Luke 22:20). Now, as Dr. Scott Hahn points out, with a Biblical covenant come blessings or curses: – blessings if we are faithful to the covenant, and curses if we are not. In Hebrews we see that it is a fearful thing to neglect attending the Eucharistic assembly. The saving efficacy of the sacrifice is fully realized when the Lord’s body and blood are received in communion. The Eucharistic Sacrifice is intrinsically directed to the inward union of the faithful with Christ through communion; we receive the very One who offered himself for us, we receive his body which he gave up for us on the Cross and his blood which he “poured out for many for the forgiveness of sins” (Mt 26:28). We are reminded of his words: “As the living Father sent me, and I live because of the Father, so he who eats me will live because of me” (Jn 6:57). Jesus himself reassures us that this union, which he compares to that of the life of the Trinity, is truly realized. The Eucharist is a true banquet, in which Christ offers himself as our nourishment. When for the first time Jesus spoke of this food, his listeners were astonished and bewildered, which forced the Master to emphasize the objective truth of his words: “Truly, truly, I say to you, unless you eat the flesh of the Son of Man and drink his blood, you have no life within you” (Jn 6:53). This is no metaphorical food: “My flesh is food indeed, and my blood is drink indeed” (Jn 6:55) (Encyclical Ecclesia de Eucharistia, 16). 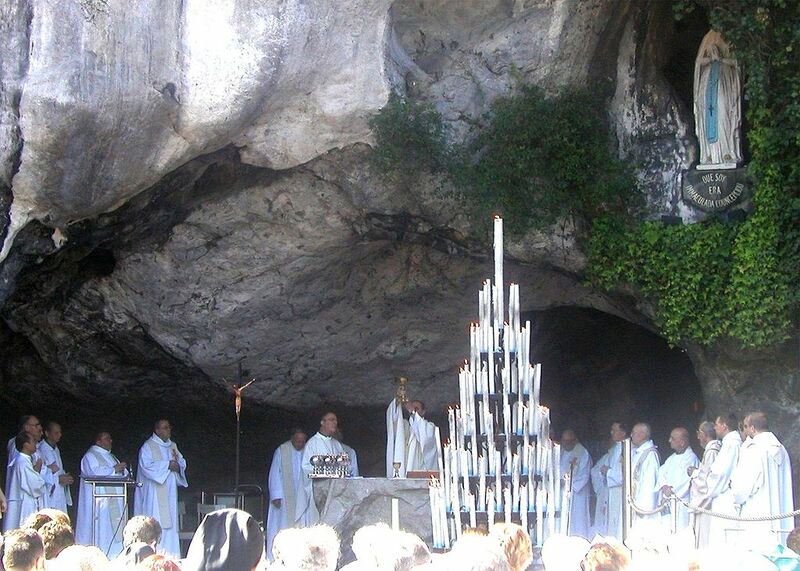 Image: A photograph of a Mass at Lourdes taken by Lima at English Wikipedia on July 28, 2006. This file is licensed under the Creative Commons Attribution-Share Alike 3.0 Unported license. Permission is granted to copy, distribute and/or modify this document under the terms of the GNU Free Documentation License, Version 1.2 or any later version. References: I am relying heavily and primarily on Scott Hahn materials for this note including his book, The Lamb’s Supper (Doubleday). The quote from Dr. Hahn is from Eucharist, Holy Meal. See also Ignatius Catholic Study Bible on Hebrews, Chapter 10, commentary notes. It was Father Faber who cautioned that Catholics cannot be tepid about the Holy Eucharist. I just beg of you teach the world how to pray Divine Mercy prayer in illustration.